Bull Rider is an upper middle grade novel (ages ten to fourteen) about how one boy and his family deal with the loss and grief brought on by war. Fourteen year old Cam O’Mara is a ranch kid from the sage brush country of central Nevada. He is a skateboarder, not a champion bull rider like his brother Ben. But when Ben joins the Marines and is seriously injured in Iraq, Cam turns to his family traditions and in particular bull riding to overcome his grief and to give his brother hope for a new life. 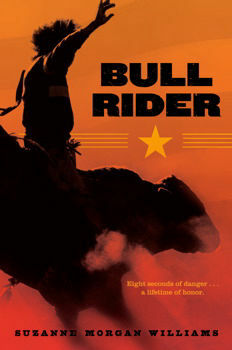 Although Bull Rider is fiction, the story of supporting an injured soldier in the family is one that is replayed many times across our nation. Writing Bull Rider was both a joy, and an emotional journey for me. I am so pleased to have met the bull riders, ranchers, veterans’ advocates and medical staff who work with our returning vets. I hope the O’Mara’s story will touch you – as writing it has touched me. Suzanne Morgan Williams' Bull Rider is available at Simon & Schuster, Amazon, or from your local bookseller – use ISBN-10: 1-4169-6130-5 or ISBN-13: 978-1-4169-6130-7; for paperback use ISBN 10:1442412526. Click here for Bull Rider reviews. Click here for Bull Rider awards. Click here for what readers are saying.